Homestyle Hawaiian was known before as Formerly Mo’s Island Grinds and Da Kitchen. 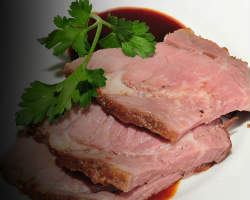 As a San Diego catering service featuring home-style Hawaiian food and catering services, it runs with a motto of: "To Provide Authentic Home-Style Hawaiian Cuisine with the Best Value." Some of the in-house specialties are yakitori style poke, vegetarian chow and pork roast. 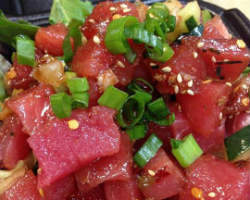 All are popular native Hawaiian food. For weddings, you can choose this hip restaurant for parties holding up to 1,000 guests. Menu line-up also consists of breakfast, plate lunches, sandwiches, locos, sides and dole whip. Get to experience real Hawaiian taste for your themed weddings, only at Homestyle Hawaiian. Buckboard Catering and Events is owned by William Benson and he believes that it’s his team, who is the big reason for this incredible restaurant’s success. Each food served at Buckboard is a blend of the right factors of brilliance, proper planning and consistency in services. Wedding catering has real yummy packages and choices, today. There are BBQ versions, fresh salads, cheese and salad sticks as well as gourmet meat presentations. Other events held are company catering, picnic gathering, bridal showers and others. Feast and galore at today’s leading group among wedding catering companies in San Diego, find your heart in Buckboard! Waters Fine Foods & Catering started ever since 1990. It is fore fronted by Mary Kay Waters. Her team is popular for giving a full-service catering with additions of creative ingeniousness and fresh ingredients, a much loved choice among guests in parties and historical events at Waters Fine Foods gourmet shops. They combine food art and high taste in plates, producing quality options in eating. The restaurant is also a go green company promoting green management and food handling in full-service catering. See Waters Fine Foods & Catering add magic to foods at California! Now, weddings couldn’t be more different. Personal Touch Dining was opened in 1988 by Executive Chef Michael Conlon and partner, Tracy Zemke, Catering Director. The restaurant specializes in full in-house catering stations and concierge. Find a long selection of treats offered at the menus. Personal Touch Dining would be glad to assist you in personal needs, when it comes to adding your own picks for the big day. Some of the food lines are Tray Passed Hors D’ Oeuvres with seafood and crawfish choices, beverage station with regular and decaf coffee and lemonade as well as the complimentary cake cutting and tray passing of cake. Being a top San Diego catering, vendor partners are Organic Elements, Starlight Photobooth, Got the Shot and others. 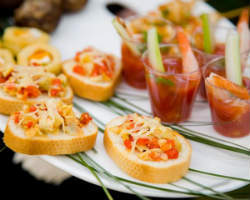 CALIFORNIA Catering Productions with the best tasting plates in town as a full-service catering group among top catering companies in San Diego. It currently takes part on Nutrition In School programs like the Life & Light Christian School Lunch Program last April 2014. At the event center venues ranges from big to small parties of all times, perfect for a full wedding celebration. Everything works at its best and food packages are bundled in affordable prices. CALIFORNIA Catering Productions bears high level of fineness and distinction at the industry. Your wedding celebration is commemorated as an indulgence of delightful and delicious affairs. Vicki Hamilton founded Crown Point Catering in 1983. From then on, the restaurant gained more number of clients and has coordinated from a small 25 number of guests to a huge banquet feast hosting 4,000 guests in private homes, venues and world class locations in San Diego. 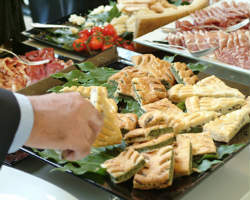 Crown Point Catering makes it a point to keep up with the latest trends in foods. Now, it even specializes on gluten free, lactose free, vegetarian and vegan cooking. In California, the restaurant has traveled from destination to destinations to serve quality food amenities. 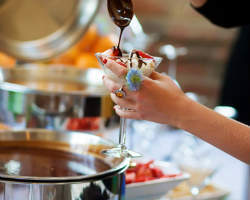 It is a leader in wedding catering companies at San Diego.